We are thrilled to present the 2019 Birmingham International Piano Festival – where we bring some of the world’s finest pianists and keyboard players to Birmingham. 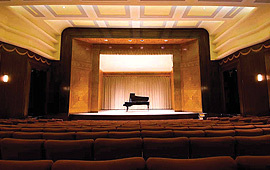 Performances will take place in the University of Birmingham’s world class concert hall in The Barber Institute of Fine Arts between Friday 25 October and Friday 8 November 2019. In this, the fifth year of the Festival, we welcome some of the world’s finest pianists and keyboard players to the city. Professor Kenneth Hamilton and Steinway's Ulrich Gerhartz lift the lid on the Henry Barber Trust funded brand new grand piano in a lecture-recital on how to select a Steinway. The festival also features a BBC Young Musician of the Year winner Freddy Kempf, a welcome return for Martin Roscoe with Peter Donohoe, Messiaen’s monumental masterpiece Visions de l’Amen, and gospel tinged and folk inspired contemporary jazz by the Sam Leak Trio. We hope you can join us for our most eclectic line-up yet.